I found that I have two binding options for the almost 2 year old unfinished Turning Twenty Quilt. Maybe this is why I did not finish it. I could not make up my mind. Luckily I kept the binding options with the quilt. 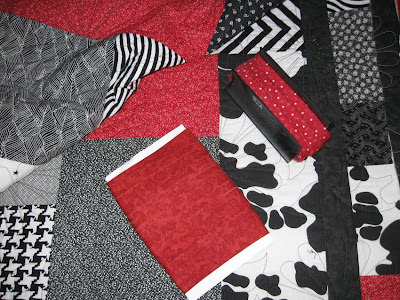 Here are my options, a handmade red/white stars binding in the top right or a Moda Red binding on the left. They both match in reds. Once I decide the one to use, my goal is to attach it this weekend! Let me know which one you like either via email off of my profile(which I think people prefer) or comment. Thanks for your great input on the turning Twenty Quilt. My vote is moda red!